Thank you for a wonderful stay at Manzanilla ridge. We had a wonderful time and the cottage was perfect. What a lovely welcome from you (the hosts) and also a kangaroo with a baby joey in her pocket! It is so nice to come somewhere which is so well set up when you arrive and also to have the delicious breakfast. The cottage was spotless and beautiful. Thank you again. I stayed here with my husband for 3 days. We had an amazing time. Sitting in the outdoor spa, listening to the sounds of the bush, drinking wine and eating cheese after a long day wine tasting! Does it get better than that! The fridge was stocked with everything we could have needed for a cooked breakfast the next morning and it was a shame to leave. We have stayed in many different types of accommodation in the Hunter Valley but will ALWAYS come back here. The privacy, set up, inclusions and location cannot be beaten. Thankyou for such an amazing experience. We had been struggling to find family friendly accommodation that would be suitable for our very active 18mth old twins while also catering for ‘mum and dad’s’ needs – Manzanilla Ridge was the perfect spot! It was safe, private, very clean and had everything we needed to be self sufficient for a week. The fact that we could wake up to freshly cooked bread, beautiful coffee and little wallabies out on the lawn made it that much more special. The nights relaxing in the spa under the stairs just finished off perfect days spent in wineries, cheese factories and the Hunter Valley Gardens. Thank you so much to the wonderful hosts, being so close to Sydney this will be somewhere we will come back to on a regular basis for some quality family time!! We had a wonderful time at the Manzanilla Ridge & Hunter Valley. The hosts we’re very friendly and informative, the location was secluded but close to wineries and entertainment. The house was clean, well stocked with a great jacuzzi and fireplace to keep us relaxed and in the end we were sad to leave. Manzanilla is on top of our list when we return the the Hunter. From the moment my partner and I arrived, we wanted to move in and stay for good. It was wonderful. The cottage was spectacular with everything needed for an amazing, romantic getaway and after such a relaxing weekend, we can’t wait to go back. I advise anyone who is looking for a private, relaxing, kick back and enjoy kind of weekend, stay at Manzanilla Ridge. You will not be disappointed. This is the perfect stay for a weekend get away or a longer break. Our cabin was so clean, tidy and in great condition. It was well appointed with everything you could need including coffee machine and bread maker with all ingrediants. Also, breakfast ingrediants from local producers is stocked in the fridge on arrival, ready for each morning. We also ordered the BBQ hamper, which was fantastic, this made the weekend easy, as we did not need to take a thing. Our cabin was private and it felt as though we were the only people at the property. With a great outdoor area to sit and admire the surrounds. The private outdoor spa is a nice way to pass the evening under the stars and enjoy a wine after a BBQ on the deck. The cabins are very spacious and even though there were four of us, it did not feel like we were cramped, with indoor and outdoor living areas. This was our first stay, however, it will certainly not be our last. I have stayed at several different properties in the Hunter Valley and this is the best I have stayed at by far. The owners of this property have thought of everything to make it as easy as possible for their guests. I have already started recommending Manzanilla Ridge to my friends. I just hope that when more and more people find out about this great spot, it wont make it harder for me to get a weekend stay. As a much needed holiday to get away from the busy life we live, my husband and I were searching for somewhere special & quiet to spend a couple of days together. The Manzallina Ridge Retreat was the ultimate getaway. It was beyond our expectations with complete seclusion giving us maximum privacy that we were looking for. With all the comforts and cosy setting, The cottage was perfect! The serenity & tranquility was priceless! We made our own fresh bread and we especially loved indulging in the hot outdoor spa and then lazily sitting in front of the fireplace for hours just talking & relaxing. Dominic was very friendly and hospitable, tending to our sensitive needs making us very welcome. The only regret that my husband and I have is that we didn’t book for a Longer stay. We are already making plans for our next trip to Manzallina Ridge. We certainly will be recommending this retreat to our family & friends. We stayed here for 2 nights for our anniversary and it was just perfect! 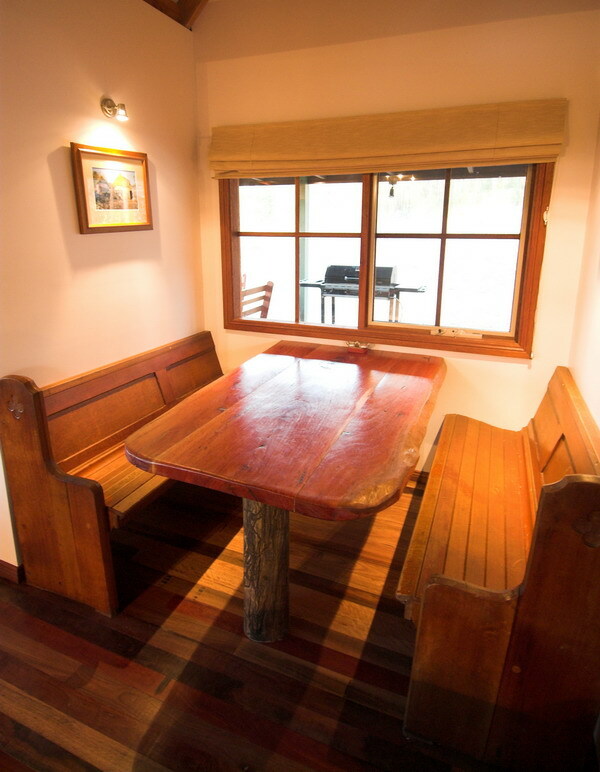 The cabin/cottage was equipped with all your needs and was more than accomodating. Its amazing location was exactly what we needed for our romantic escape, with nothing but nature surrounding you, you feel at ease and so at peace. You can choose to hideaway for your entire stay or even visit the local wineries and sample cheeses – they are all near each other without being in the middle of it all! The fireplace added that cosy touch and the jacuzzi was so much fun as we got to gaze at the bright stars whilst sipping on champagne! The bedding was also great! With an option to sleep upstairs or down – I would highly recommend this place to anyone! We would definately come back again and opt for a longer stay! Only disappointment we had was that we had to leave! So happy to have booked at Manzanilla Ridge. It was just for a weekend but definitely next time I’ll book for more days. The cottage was perfectly clean, kitchen self contained, amazing hot outdoor spa, quiet and peaceful place with full privacy. It’s the perfect destination for a romantic getaway, but also it could be a great plan to have a special and unforgettable family time. Manzanilla Ridge is definitely a place to recommend to others and a place to stay more than once. Thanks heaps for a great service and see you soon! My Wife and I recently Stayed @ Manzanilla Ridge for 2 nights and found it the perfect place to chill out, and enjoy each others company, Tucked away in a small clearing you feel like you are a hundred miles away from anyone else. 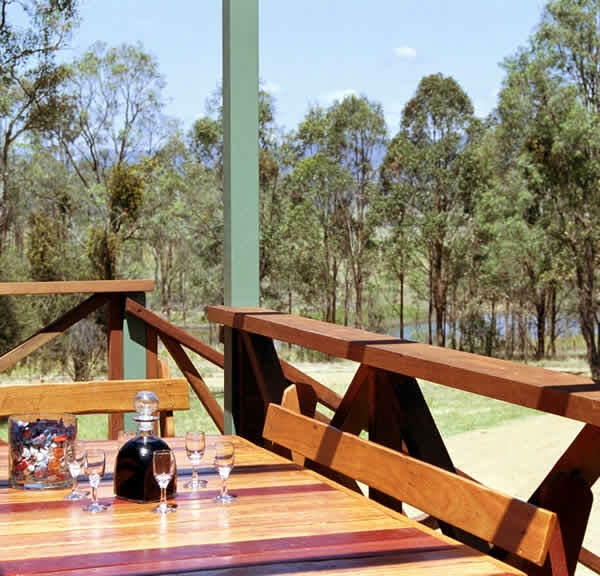 The cabins are perfect to cook up a home cooked meal, and sit out on the decking and enjoy a Hunter Valley wine, or three !! We look forward to our next stay at Manzanilla Ridge, and next time will be longer than 2 nights. Just returned from a two night weekend and was very impressed. A wonderful getaway in a perfect location. The cabin was spacious and had everything you could possibly want. Two days weren’t long enough. Hosts were very helpful and respectful of your privacy. We stayed in the furthest cabin and it felt like there was no one else around for miles. Outdoor spa was a great idea and cooking breakfast on the outdoor BBQ with the included supplies made mornings easy. This place is on our list of places to return to. Wonderful 3 days here which wasn’t long enough. Beautiful location and peaceful and relaxing. We had the end little cabin called Salcombe and had total privacy. Highly recommend you ask for that one. Sitting in the hot spa at night and watching the stars was just amazing and beautiful. Loved the trees all around and the butterflies,dragonflies and birds. Breakfast supplies very generous and enjoyable. Highly recommend for a romantic stay and anniversary celebration. My partner and I decided to take an impromptu trip to the Hunter Valley, neither of us had visited there before. 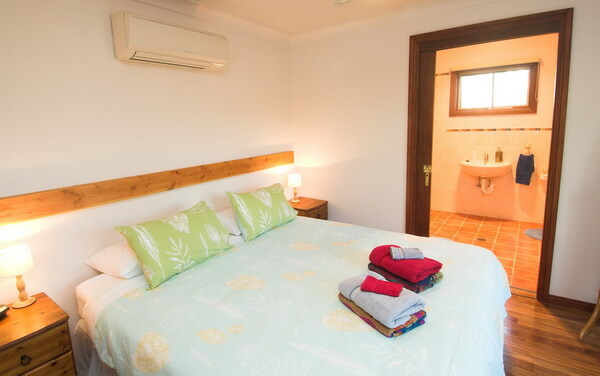 When reviewing all of the accommodation available I settled on the Manzanilla Ridge. 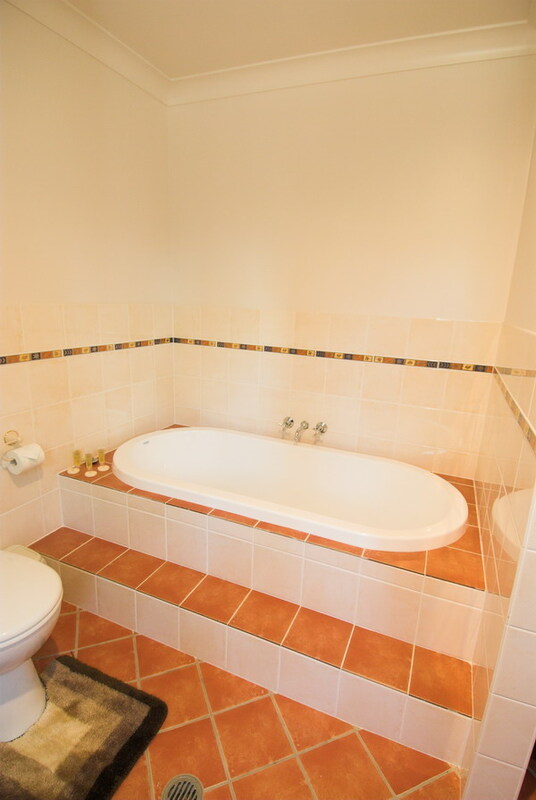 It was self contained two bedroom cottage, secluded and close to the winerys. The photos did not do this lovely group of cottages justice. You are greeted on arrival by the lovely owner and she is well informed with the activities available in the region. You have everything at your finger tips… An outdoor spa, bbq, outdoor decking for entertainment, indoor kitchen where you are provided with a brekky hamper, fire place with plenty of wood on hand and two lovely bedrooms with air conditioning if required. I cannot recommend this place enough to my family and friends now. We had the best time surrounded by mother nature. Make the booking today, you will love it! What a relaxing weekend getaway location! I surprised my husband with two nights at Manzanilla Ridge, staying in Carrickalinga Lodge, and it was fabulous. We both enjoyed our private spa bath and enjoyed a couple of walks around the property. The bbq breakfast was yummy and we used the bread machine to wake up to hot bread in the morning. The location is superb, completely private and extremely quiet. Dominic was very accomodating and ensured that our trip was most enjoyable. Thank you! Thank you to Dominic and Jane for the most relaxing and luxurious 3 nights. Me and my partner were looking for an isolated country escape and we got just that and so much more! The cabin was clean and inviting, a real home away from home. This accommodation really made our trip spectacular, with using the spa on the deck under the stars to waking up to the smell of freshly baked bread. We couldn’t have wished for anything better and will be making this a yearly tradition to come stay. I would recommend this to anyone who wants privacy, luxury and a true country escape in the most beautiful of surroundings. We stayed for the June long weekend 2013. What a wonderful place to stay. When we arrived the fridge was packed with lashings of local bacon, eggs, tomatoes, milk and juice. The heated spa made for lovely evenings in the cool air then back inside with the cosey wood fire. Our wee 18 month old daughter loved the adventure and was just amazed by the wildlife. Kangaroos got a hearty “Hop, Hop! !” Dom and Jane’s hospitality and local knowledge are fantastic. Winery an wine recommendations are worth the stay alone!! Thanks again. We stayed for 2 nights in August. The 2 bedroom cottage was modern, private and had every comfort covered. The breakfast provisions are excellent. It is a great escape yet still handy for vineyard touring. Thanks Dominic for all your warm hospitality. A really enjoyable and unique stand out experience in the vineyards. We stayed at Manzanilla for 4 nights and could’ve stayed for so much longer! Everything was just fantastic, it was private, secluded and so relaxing! Dominic and Jane have provied all the essentials, everything has really been thought of! We especially loved the spa, lighting our own fire and baking bread in the bread maker which we’ve never done before! The BBQ was great, we cooked everything on it!! Although the kitchen is fully stocked with equipment, we chose the BBQ – less mess! The full size fridge was great to store all our food and drinks – and it even came stocked with the great breakfast hamper! The cottage was very clean and spacious but still felt really cosy – it was a home away from home which is what we wanted and needed! The surroundings are gorgeous, lots of land and trees. We were greeted with some kangaroo’s on the first morning which was lovely! It really felt like we were away from our busy lifestyles. Thank you Dominic and Jane for providing us with such a lovely place to stay and for really putting in alot of effort with supplying us with everything we needed for a comfortable holiday. I haven’t stopped telling people about it and recommend it to everyone! We will DEFINITELY be back! Last weekend we went away to the Hunter Valley for a girls weekend. After alot of research we decided on the Manzilla Ridge as the place we would stay. What a great decision that turned out to be! The cottage was just beautiful…the view was fabulous and the breakfast hamper was just perfect. Dominic and Jane are really great people, they love the place and it really shows! Can’t wait for our next stay…. We recently stayed at Manzanilla Ridge for a two night getaway before our baby is born. Its a lovely secluded place that ticked all our boxes. Nestled within the wineries and restaurants, we popped in and out as we chose. We wouldnt hesitate recommending this place to anyone in the future. 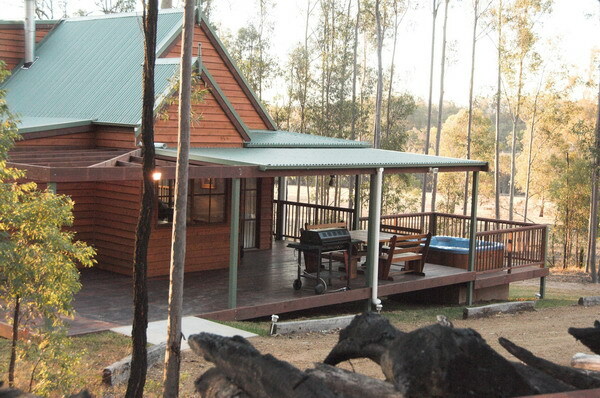 4 relaxing days in the serenity of the bush but only a short drive to places of interest. 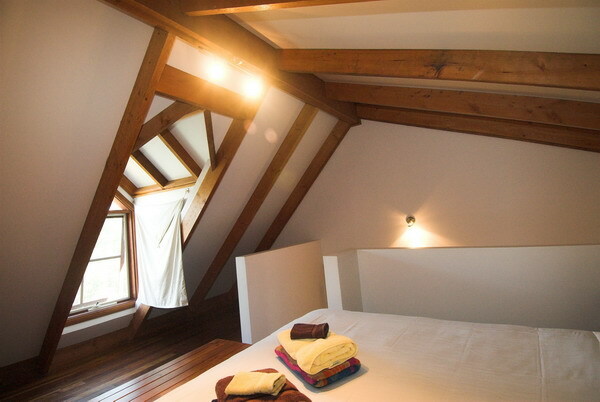 Good clean comfortable accommodation in very private setting. The four of us (All Adults) stayed at Manzanilla for only 2 nights and would have loved to stay for so much longer! Everything was just fantastic, it was private, secluded and so relaxing! Dominic and Jane have provied all the essentials, everything has really been thought of! We especially loved waking up in the morning the the smell of freshly baking bread in the bread maker. We have never used one and the instructions were very easy to follow. One of the best features was the the BBQ. We purchase the BBQ pack and the steak was perfect. We are from the beef capitol of Australia and the meat was the best we all have tasted. Also cooking a hot breakfast with the supplied breakfact hamper was great. The kitchen is fully stocked with equipment, but we chose the BBQ – less mess! The full size fridge was great to store all our food and drinks. The cottage was very clean and spacious but still felt really cosy – it was a home away from home which is what we wanted and needed! The surroundings are gorgeous, lots of land and trees. We saw some kangaroo’s over the 2 days which was fantasic to see. It really felt like we were away from our busy lifestyles. We didn’t try the spa as it was around 36 degrees so the air conditioners were perfect. Thank you Dominic and Jane for providing us with such a lovely place to stay and for really putting in alot of effort with supplying us with everything we needed for a comfortable 2 days. I haven’t stopped telling people about it and recommend it to everyone! As we live in Rockhampton, Queensland, we will DEFINITELY be back if were are in the Hunter Valley again but for a few extra days as 2 days is definitely not enough! My fiancé and I stayed at Manzanilla Ridge for a much needed relaxing break. When we arrived and pulled up to the front of our cottage we were so impressed, it was even better in person than in the photos we had seen – the accommodation was absolutely beautiful and the surroundings were so peaceful. Two nights was just not enough and we are already planning our next stay. 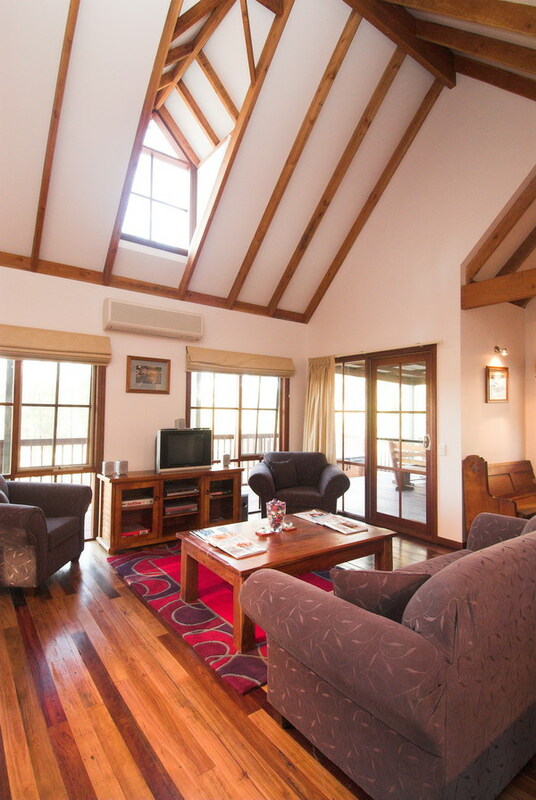 We would highly recommend Manzanilla Ridge to anyone looking for accommodation at the Hunter Valley. We look forward to bringing our family and friends next time. Thank you to Dominic and Jane for their outstanding hospitality. When we first arrived Dominic was so welcoming and helpful, even arranging our wine-tasting tour for the next day! The cottage was magical, like our own little chalet, and the view from the spa was amazing. We especially enjoyed spotting the wildlife coming and going and being sung to each morning by the chorus of birds. We would definitely return to Manzanilla Ridge and have already highly recommended it to our family and friends. Dominic and Jane should be proud of what they have created. Excellent accommodation for a romantic weekend away for two (although the cottage could easily accommodate many, many more). My partner and I absolutely loved the cottage, the Jacuzzi on the deck and the amazing ambience combined with wonderful hosts who were always there if you had any questions. It was great to have a wine rack stock3ed with local wines- which was excellent as we ran out New Years night! Highly recommend this property for couples, families and groups- it had all the things that you could ask for + so much more. My partner and I stayed at Manzanilla Ridge whilst attending the Bruce Springsteen concert. It was the perfect weekend after a hectic start to the year. Dominic and Jane were the perfect hosts. A wealth of local knowledge and accommodating in every way but also in a way that you wouldn’t know they were there. We felt like we were the only ones there due to the seclusion. A beautiful rustic cottage with a barbecue and sunken spa on the deck with views over the valley. It was the little touches that made it feel like a home, bread maker, welcoming port, well stocked fridge, big comfortable beds and so much more. Thank you for the most secluded and peacefully easy stay. We arrived to a fireplace ready to be lit, with port on the table ready to be served, with music playing across the lovely sound system, Jacuzzi already warmed and yeast and breadmix available to create our first loaf of bread. We even appreciated that you had a few wines in the rack in case we forgot on Friday to collect some before leaving work. The cottage was lovely and had everything we needed…. and more! We look forward to coming back and thank you again for being wonderful hosts – knowing exactly what a couple after a long week of work need – tranquillity, peace and seclusion. Manzanilla Ridge ticked all our boxes. We both loved this place and were sad to leave. It was absolutely an amazing stay. If you want a get away with your partner this is the place to go. We loved the seclusion of the cabin and the scenery. Our favourite was sitting in the hot tub in the evening looking up at the stars drinking port and wine from the near buy vineyards, then going inside to our wood fire log heater to relax. The cottage was immaculate and all necessities provided. The owners Dominic amd Jane were great and very informative. We will definitely keep coming back, one of our favorite places. We recently stayed here for 2 nights for our wedding anniversary. Dominic and Jane were very welcoming and helpful when it came to suggestions for places to eat and wineries to visit. 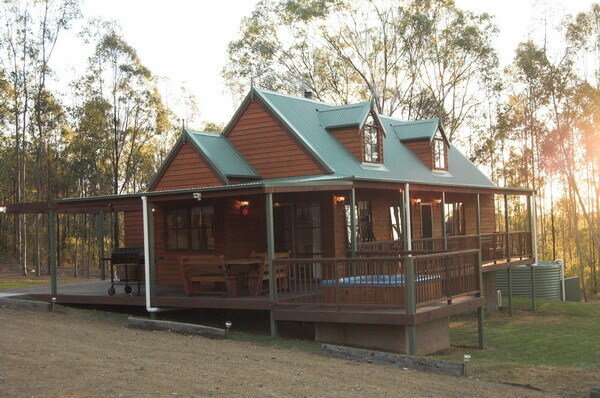 The cabins are very private and peaceful and perfect for this type of getaway. Manzanilla Ridge is only a short drive to lovedale and pokolbin wineries, but far enough to not be in the hustle and bustle of the busy tourist areas. We will definitely be back and will recommend it to friends and family. Stayed for a girls weekend away and it was fantastic! Our cottage felt like home as soon as we walked in the door. The hot tub was amazing, it was great to come back from a day of tasting wine to get in and soak and watch the sun set. We had everything we needed for breakfast both days supplied ( also there is a bread maker which was great to have freshly made bread from ). They only have the 4 lodges and all are completely private with there own access road. Meaning you can walk around as naked as you like and the only things that will see you are the occasional wallabies that pass by and the birds. The properties are awesome with a nice outdoor deck featuring a hot tub, BBQ and table and chairs. Inside has everything you need. 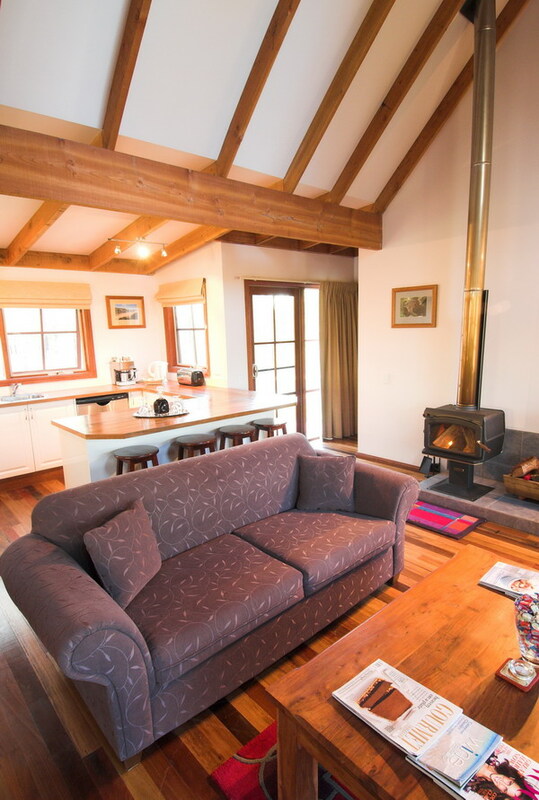 Comfy lounge area with TV and dvd player, large comfy bed, fireplace and the kitchen is well equipped. The hot tub got used morning and night and is easy to use. Great for relaxing with a drink. They even provide a bread maker (including ingredients) which you can set so it cooks early morning just in time for breaky and a coffee machine also well stocked. The fridge is well stocked for breakfast including bacon, eggs, OJ, milk, butter and Jam and there is complimentary port. All condiments are included so you don’t really need to take anything with you and there is a microwave and dishwasher. The views are good but slightly limited due to the surrounding trees. But these provide the privacy which I would choose everytime and is the best thing about the lodge. And you are only minutes away from some attractions and within 10 – 15 mins of most places in the area. I wouldn’t stay anywhere else now I know these are there. And great value for money especially if you get the midweek rate. For those incapable of putting their phone down there is no wifi which I consider to be another positive. If you can’t find something better to do in a place like this you should probably stay at home. We had a wonderful time in our quiet secluded cabin. It was decked out very cosily, and the outdoor hot tub was a nice treat. Dominic and Jane were both lovely and extremely helpful. Waking up to birdsong and the smell of freshly baked bread was a beautiful way to greet the day, and left some wonderful memories. We will be back, and we’ll be bringing our friends. We have stayed at Manzilla Ridge many times in the past. Unfortunately for us it has been some time since we last visited. I am so looking forward to our time away and catching up with Dominic and Jane. 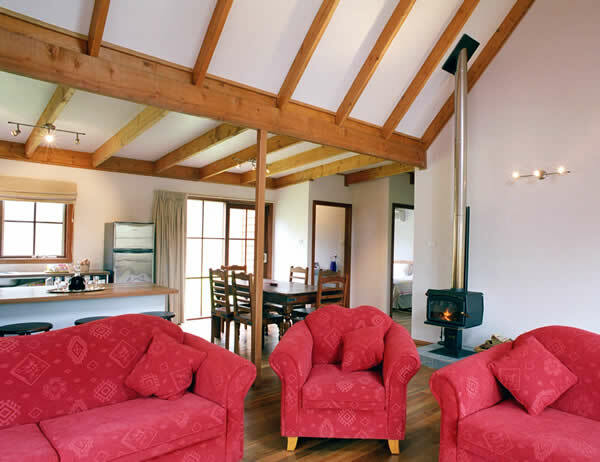 The cottages are so lovely inside and secluded which makes it even a better escape away. I am really looking forward to the lovely peaceful. Well nothing at all has changed. It is just like coming home and catching up with great friends. Came for a weekend concert….Beautiful cottage, spacious, quiet & secluded…just only had to bring ourselves as everything else was abundantly provided….especially for breakfast each morning! We had everything we needed for a great time! Outdoor spa was fun & worked well. Fabulous Lillino’s restaurant & winery just 5 minute drive away – great Italian food!! Only regret was that we should have stayed longer!! Thank you!! My new husband and I stayed at Manzanilla in January 2017. We love these cabins for their seclusion and rustic charm. The spa, breadmaker, breakfast all make up for one amazing experience – topped off by the great hospitality of Dominic and Jane. Thank you for a beautiful couple of days!